Tis the season for snow! There are so many fun things to do this time of year. From making snowmen to having an epic snowball fight, the ideas are endless for how you can have fun in the snow. One fun activity to do this time of year is make snow sculptures. While a lot of people think that winter sculptures can only be made from ice, you can also use snow to make beautiful creations. Are you interested in making your own snow sculptures this winter? If so, you have come to the right place. Today, I'll give you everything you need to know about making snow sculptures. Hopefully, by the end of this article, you'll be inspired and ready to get outside. Before you begin creating your snow sculpture, you'll need to come up with a plan. Decide what kind of snow sculpture you will be making. Some people make animals, people, castles, and basic shapes. Once you have decided what you want to build, you may want to sketch your design on a piece of paper. Another option is to make a mini model of your snow sculpture idea before you actually begin building. That way, you will have an idea of how you want to build it and what you want it to look like. Slightly wet snow is the type of snow that works best for sculpting. If you want to start building when the snow is still powdery, add small amounts of water using a spray bottle. If you need the parts to stick together better, you may need to add a little more water to the snow. 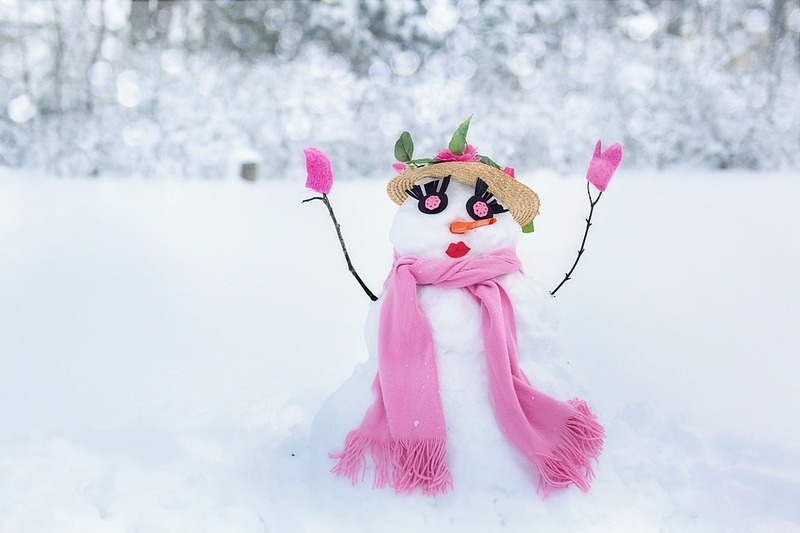 Also, before you begin sculpting your image, you may want to stir up the snow. This can be done with a snow blower or by simply shoveling the snow into a mound. The movement heats up the snow and removes excess ice chunks. This will make it easier to make your snow sculpture. Using your hands for sculpting is definitely an option, but sometimes you need a few extra tools to add more detail to the sculpture. 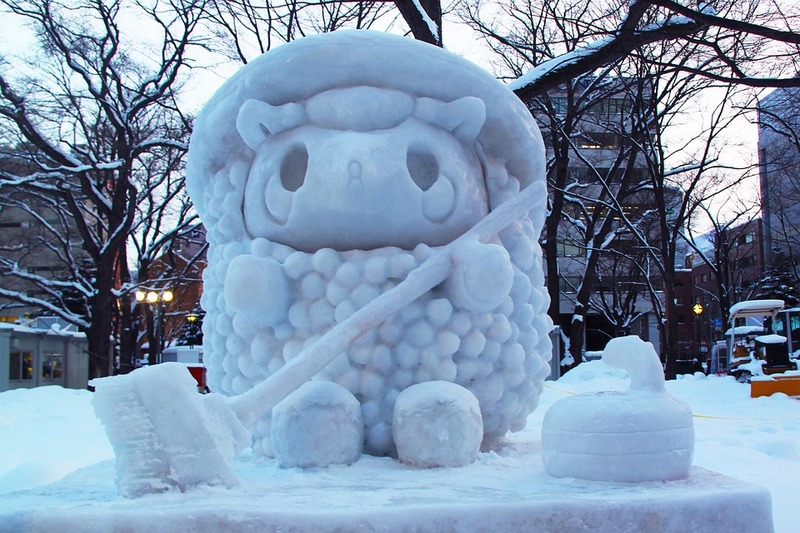 Professional snow sculptors use items like ice chippers, saws, augers, and hatchets to create their designs. However, you can use household items to make your sculpture. Milk cartons, a garbage can lid, and other empty containers are great items to use as tools. You may even consider using items like spatulas, spoons, shovels, and ice cream scoops to help you carve interesting shapes. Once you have all your tools and the proper snow, it is time to start sculpting. First, make sure you create a firm foundation for your snow sculpture to sit on. After that, you’ll need to gather up the snow and pack it into a dense pile, large enough to carve your sculpture. Next, start sculpting by removing large chunks of snow. Remember that if you need glue, simply add water to the snow to make it slushy. Once the main shape of the sculpture is completed, it's time to start carving! Use the tools I mentioned above to carve your sculpture. If you want to add color to your snow sculpture, simply mix food coloring with water and pour it on. Make sure you add enough food coloring because it takes a lot of food coloring to make the snow become colorful. The reason why you are using food coloring is that food coloring is safer for the environment than paint. Another environmentally friendly option is to use colored floodlights instead of chemicals to color your sculpture. Keep in mind though that adding color to the white snow will make it melt faster. Darker colors will especially make it melt faster because they absorb more light and convert it into heat. Making snow sculptures can definitely be a chilly project. Make sure you dress warmly with a few layers of clothing on. Because you will be using your hands a lot, wear waterproof gloves that will keep you warm. Mittens will work too, but you may need to use your fingers when creating the sculpture. If possible, avoid wearing ski gloves, as they can leak color onto your sculpture and can easily get soaked and freeze. Also, since you will be on your knees a lot, you may want to wear knee pads so that you stay comfortable as you carve your sculpture. Just because it isn't summer doesn't mean that you still can't get sunburnt. The sun often reflects off of the snow, which is why sunburns during the winter time are sometimes called "snow-burns". These reflected rays can then hit your skin, and overexposure can cause sunburn. Building a snow sculpture requires a lot of moving around and shoveling snow. Choose a safe location that is not near a highway or sidewalk. Also, make sure your snow sculpture won't be blocking any driveways or sidewalks when it is finished. Before you begin building your snow sculpture, make sure you choose the proper location. If you will be building lots of snow sculptures, you may want to space them out. Looking for some ideas to inspire you? Look no further! 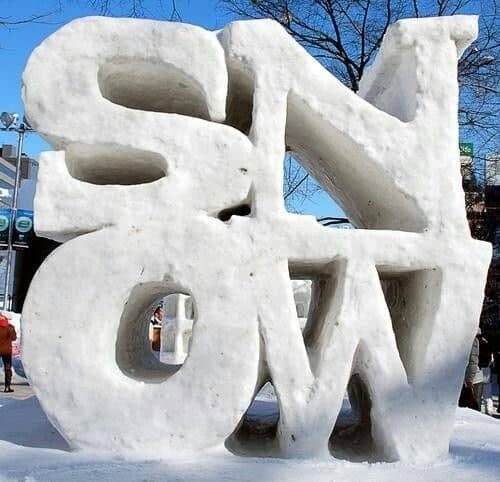 These amazing snow sculpture ideas are simply incredible. Some of them are easier to make than others, but all of them are made from snow. 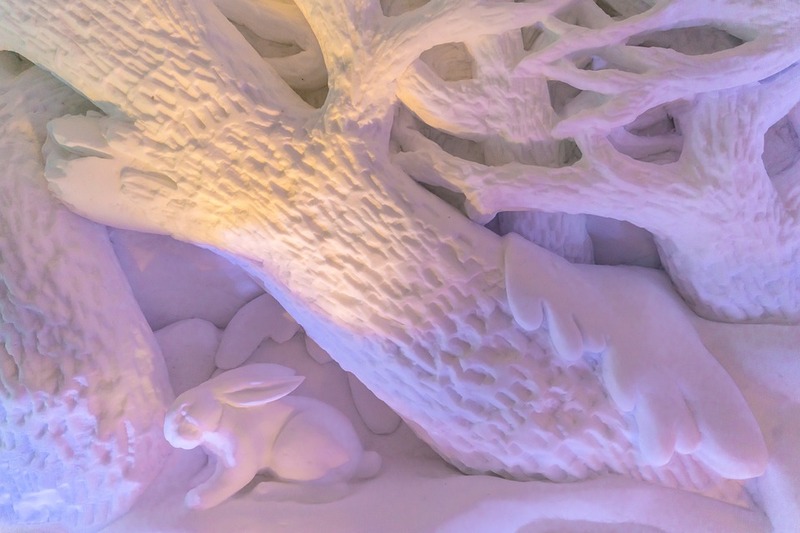 Be inspired by these snow sculptures below. This snow sculpture is the perfect option for any backyard. Once you have carved the deer, all you do is add two sticks on top of its head for the antlers. This deer could be any kind of deer you want it to be. It can be a regular deer, an elk, or even a reindeer. You can even build a sleigh and Santa Claus out of the snow to go with this deer. 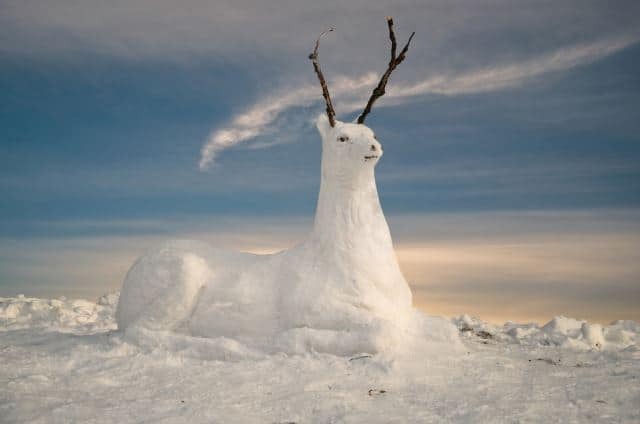 Have fun using your imagination as you create your very own snow deer. This whale looks like it really is breaking through the snow. As you can see this snow whale will take longer to make than other simple little snow sculptures. If you wanted, you could make this snow whale smaller. And you can also turn this snow whale into any other fish you want. Use your imagination! Creating snow messages is easy and fun. You could write messages like "Snow", "Merry Christmas", "Winter", or anything else that pops into your mind. If it is somebody's birthday, you may have fun carving their name into the snow. Snow creatures are so fun to make. Have fun carving out any animals that you'd like. They could be hedgehogs, porcupines, deer, insects, and any other creatures that you are fascinated by. You can even sculpt creatures that don't even exist. Creating a car out of snow is such a fun activity to do. You could just make one big car, or you could create a whole highway of small cars. 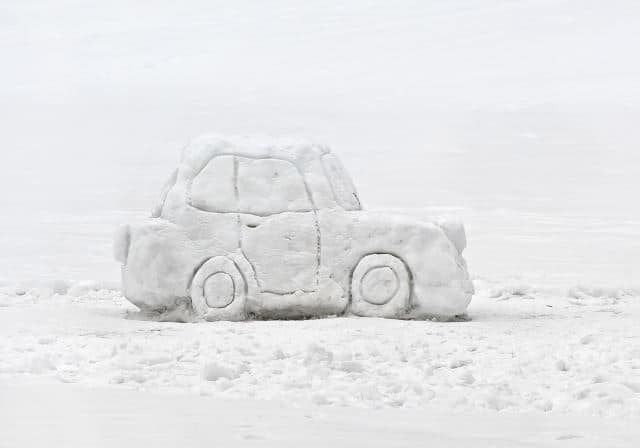 This snow sculpture can be a fun activity for kids that love cars. If you are feeling creative, you could create a highway with cars that go all around your lawn. 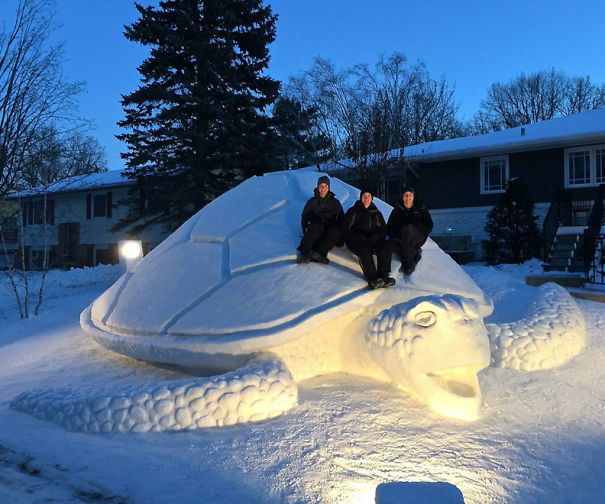 This gigantic snow sea turtle is definitely something you'll want to take a picture of. 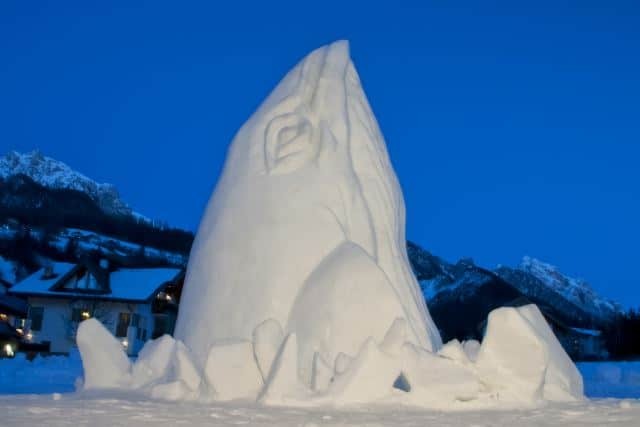 This snow sculpture will probably take a while to make, as it is very large. If this snow sea turtle is too large for your yard, you can always make it smaller. 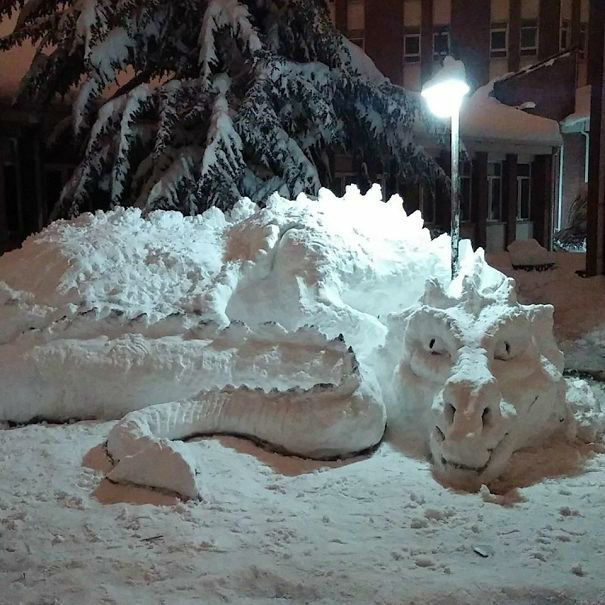 Impress your neighbors by making this large snow dragon. The people who made this snow dragon built it around a light so that it could be seen at nighttime. However, you don't have to do that. If you wanted, you could sculpt this snow dragon in such a way that it looked like a snake or alligator. There are so many fun activities that you can do in the winter. If you have been looking for some snow sculpture ideas beyond the traditional snowman, you have come to the right place. 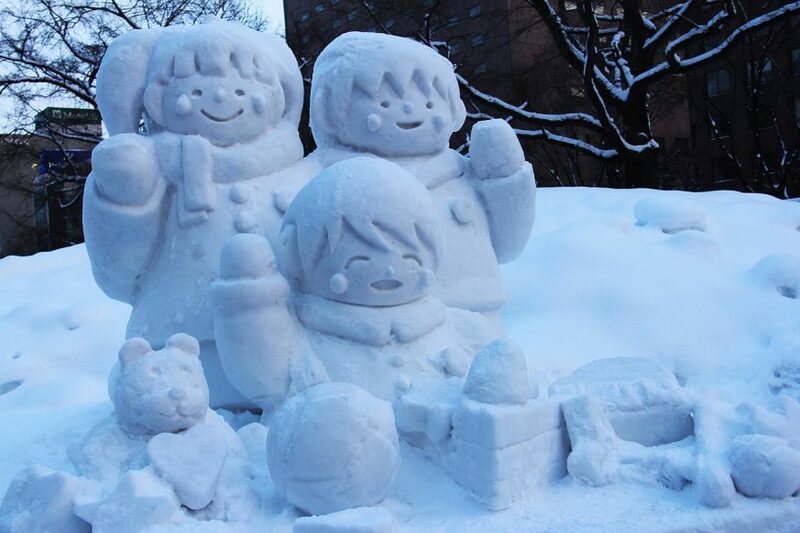 There are so many different snow sculptures that you can make during the winter. While professional snow sculptors use tools like ice chippers and saws, you can easily make snow sculptures by using household items. Make sure you dress warm and don't forget to wear sunscreen. Depending on what kind of snow sculpture you are making, you may be outside for a while. Remember that if the snow is not sticky enough for making snow sculptures, you can always add more water. The added water will make it slushy, which is what helps make the snow stick to each other. I hope this article has inspired you to get outside and make snow sculptures. Snow sculptures are so fun and easy to make. Don't forget to take a picture of it when you are done so that you can always treasure this memory. Have fun!